3 Easy No Credit Check Payments on Behringer X Air XR18 Digital Mixer only at AMS ⚡ Free 2 Day Shipping ⚡ Free Extended Warranty ⚡ Call our Gear Experts at 800-319-9043 for expert advice! When your application calls for a multiple-microphone setup, such as an onstage panel discussion, press conference or courtroom proceeding, etc., it can become a challenge to maintain so many open mics – and preserve maximum gain and priority for the moderator. 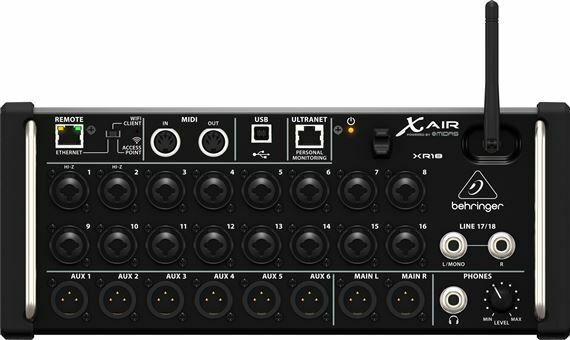 A major first for compact audio mixers, the revolutionary X AIR Gain Sharing technology can easily manage fully automated mixes with up to 16 live microphones. Equipped with the very same FX engines as the now legendary X32 Digital Mixing Console, the onboard virtual FX Rack provides access to four true-stereo (8 mono), multi-effects processors including delay, chorus, dynamics – plus the XR18 can run production-quality, true-stereo reverbs concurrently with 31-band EQ on the main and aux buses, all without the need for any additional hardware. Custom-designed, and physically modeled after some of the most iconic and sought- after processors, all effects run inside the low-latency environment of the X18 mix engine, ensuring flawless performance, flexible routing and the end of cable faults forever! 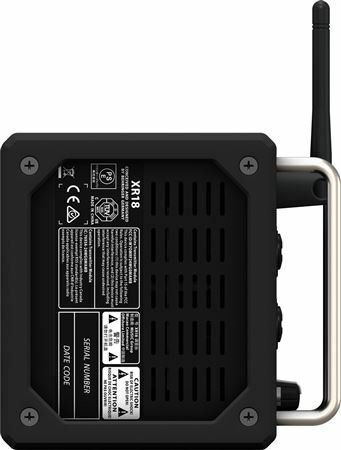 The XR18 includes a high-resolution 100-band Real Time Analyzer (RTA), with full Bar and Spectrograph views. This high-resolution RTA displays the audio energy distribution in 100 frequency bands over time – capturing a sonogram window of a full 10 seconds. Switch between the Large RTA view, displaying any available signal in full screen resolution, or the Combined RTA view shown above each of the channel and bus EQ curves – and see the results of your filtering choices. Additionally, the RTA can be displayed on top of the 31-band graphic EQs in the Main LR or Aux buses. 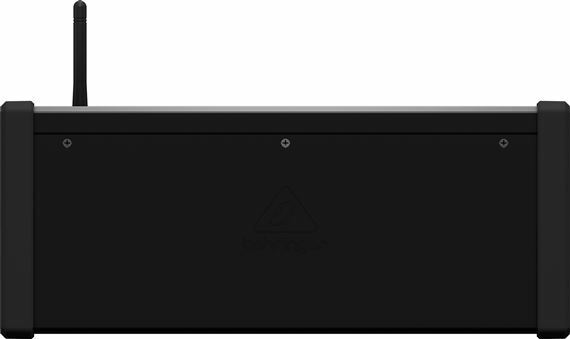 Monitoring and controlling frequencies has never been easier! The easy way to send sound, ULTRANET connectivity allows you to send 16 digital sources over a lightweight and easy-to-deploy Cat 5 cable to P16-D Digital ULTRANET Distributors, or directly to P16-M Personal Monitor Mixers. This powerful and advanced technology makes it easy for individual performers to create their own “more me” mix – and frees you up to put on your best show. An amazing piece of gear... but... have a back-up plan! For our small club shows, this thing is AMAZING. Some caveats: 1. 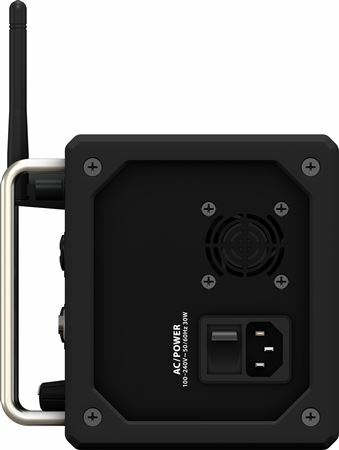 Needs to be setup well in advance; Not a plug/go sort of thing, but the features are well worth it. 2. Sometimes it can be hard to do something quickly (volume/mute feedback) 3. Have a backup plan. Let me explain the back-up; We're a small 3 piece acoustic act that does our own sound. We were playing a large outdoor street party festival and kept having trouble connecting wirelessly. Ended up having to borrow a hard-wired mixer from one of the other (very generous) acts. Later, we boiled it down to interference (everyone has Wi-Fi in their pockets these days), and obtained a hard wired backup solution (windows laptop w/ethernet) for our larger shows. I highly recommend this. 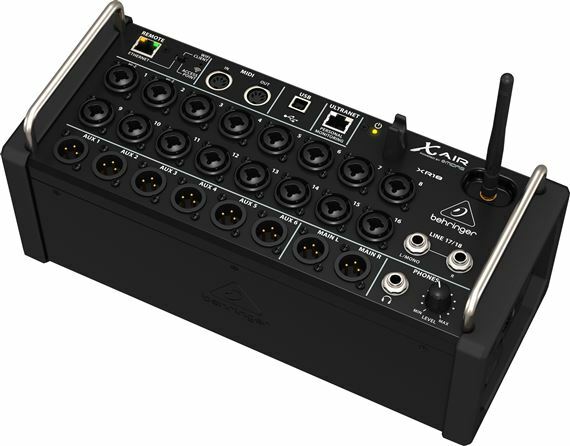 We're also now using the Behringer X-Touch Compact connected via MIDI for a tactile interface for more immediate actions which works in our situation, but is very limited for this use. Still a great piece of gear. I love the portability of this product. I don't have to lug around a 32 channel mixing board anymore. I just plug and play, and use my ipad to control everything. 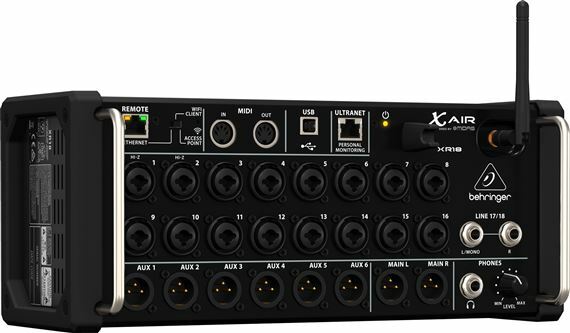 The wonderful thing about this mixer is that is has all of the effects as the 32 channel X32. I love it and won't trade it for the world. I recommend everyone who reads this to at least try it, I guarantee you will like it. Opens up a whole new method of control! Excited to continue to learn the possibilities! This is the best mixer out there for a perfect price. Saves time and the software runs flawlessly. We sound even better than before. This was shipped very quick and has saved me from loading and unloading an Analog Board/EQs/Effects. Works great! Amazing piece, worth way more than I paid. I mixed a live jazz band and a live top 40 band in a room that was not acoustically friendly and this piece made it easy. They sounded amazing. I love this equipment because I can walk around the church an adjust the volume!! I have already recommended this product to several bands and churches. This creation is going to save my back ! So far so good I have set it up and get here monitors working getting ready to use it this coming week for the band to go live with a digital board everyone will have their own monitor mixes and I won't have to control them they will all have the app and they'll have total control of what they hear.